It's widely assumed that when the original Middlewich Folk & Boat Festival came on the scene in 1990 the Middlewich Carnival, at that time organised by Middlewich Round Table, disappeared. 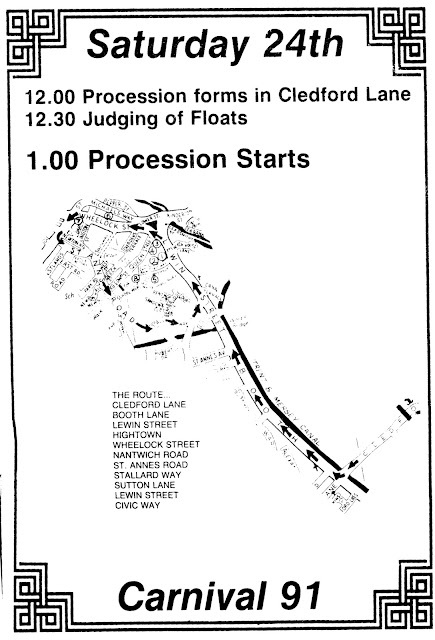 This surviving programme from 1991 shows that the Carnival carried on for at least one more year. 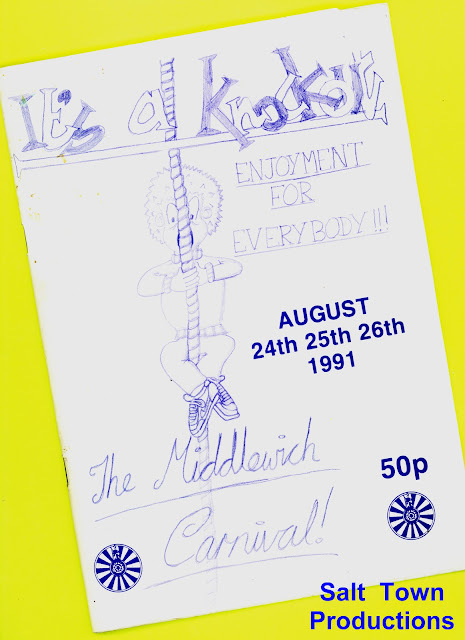 Does anyone remember if this was the last Middlewich Carnival of all? The cover is the result of a competition organised by the Round Table and was designed by a pupil of St Mary's RC School. Unfortunately, although this information was given in the programme itself, the name of the winning artist was not. It would be interesting to know the name of that pupil. The method of printing (and the programme has all the hallmarks of being the work of J&M Print) used for the cover - blue on a glossy white background - has made it difficult to reproduce here. 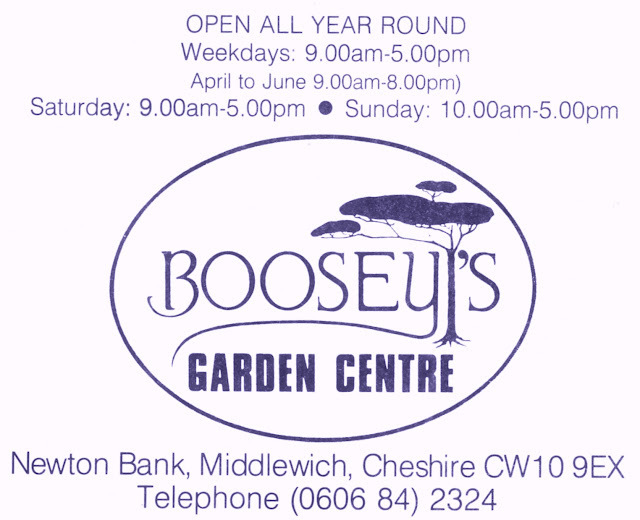 We've also been able to record something else for posterity - Boosey's opening hours, seasonally adjusted to take advantage of lighter nights between April and June. Note also that early version of Middlewich's STD code, before the '1' was added and six figure numbers starting with '73' and '83' introduced. There are also many other adverts in the programme, which we're dying to - and will - show you here on the Middlewich Diary. They include: Albert Atkinson (video - audio sales & service, Wheelock Street), G Dickinson and N G Stott (Dispensing chemists of Wheelock Street and Lewin Street - now both branches of Rowlands) Middlewich Fire & Heat Centre (Town Bridge, now an estate agents), Powell's ('quality menswear for the discerning man'), JJ Skellon Ltd (stockists of Clarks, K. Shoes, and Lotus), Knights & Dames, Wheelock Street ('night-time Kebab House, day-time Cafe'), R&H Taylor, 9 Wheelock Street (Newsagent & Tobacconist), Barber's (Tel 2537/2328 For Fresh Fruit, Vegetables and Fish), Fred Cash Ltd (Directors A Platt, A E Platt), R. A Devaney (Pallets) and many more. 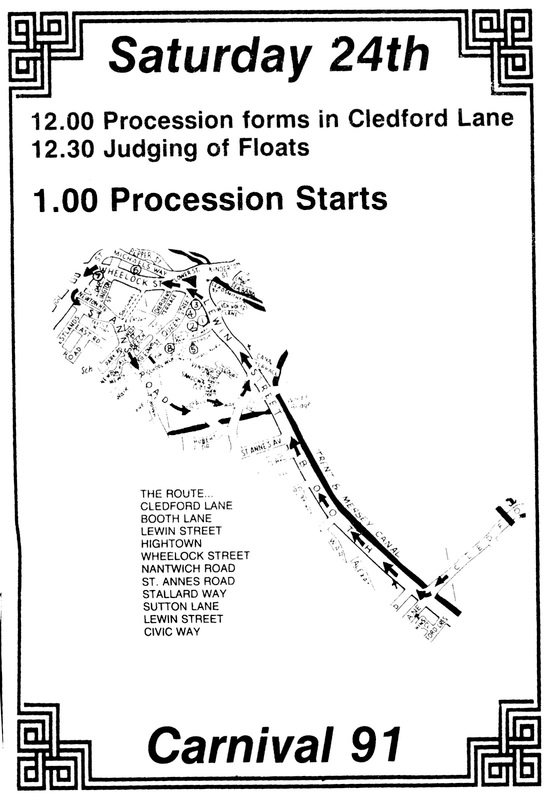 We will, of course, be returning to this particular programme many times to show you some of these advertisements and the rest of the programme, including the welcome from the then Round Table Chairman Derek Davies, and the message from Town Mayor Gerard Devaney. I think it was the last one. I recall a Round Table 'delegation' tried to persuade us to move the Folk & Boat Festival to August to include the Carnival. I tried to convince them to keep the Carnival going as it was, but members just didn't have the time and numbers to continue it.